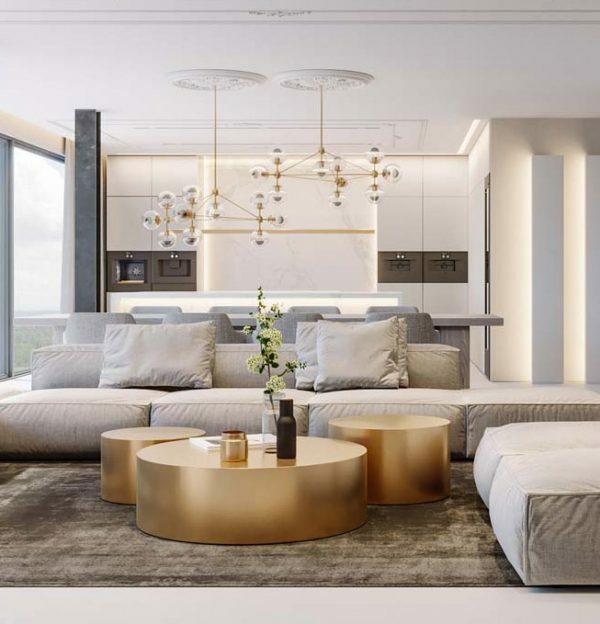 A coffee table is undoubtedly a classic staple that can make or break a room's design, but they aren’t just for throwing your feet up anymore. Modern coffee tables can create extra storage, include a pop-up workspace, double as a terrarium, or even be a spot to stash your cold snacks! 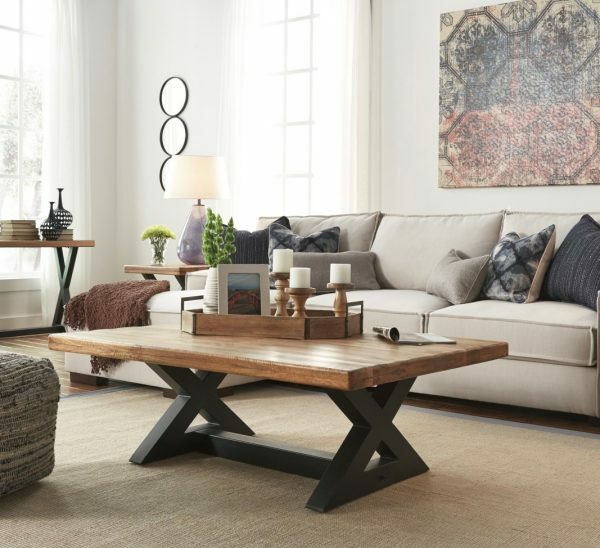 From hyper functional to simply stylish, see how much zing a coffee table can add with our expertly curated collection. From mid-century modern to farmhouse chic and everything in between, we made sure to include an array of designs to fit every style and budget. All you have to do is choose which one you like best! 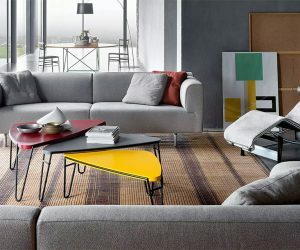 Dual-tone Slide-Open Modern Coffee Table With Storage: More storage? Yes, Please! This dual-tone, modern design easily slides open to reveal 4 storage compartments. Great for stashing your magazines, books, or odds and ends. 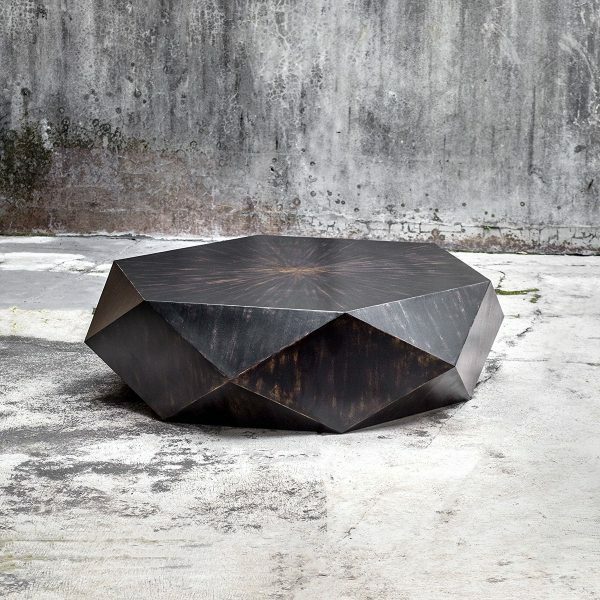 Large Faceted Coffee Table: An unearthed gem of the modern design world. The black finish is artfully applied and manually worn down to reveal warm honey undertones on this geometric masterpiece. Created with a mix of hardwood composite, java wood, and mango wood, this is a coffee table built to last. 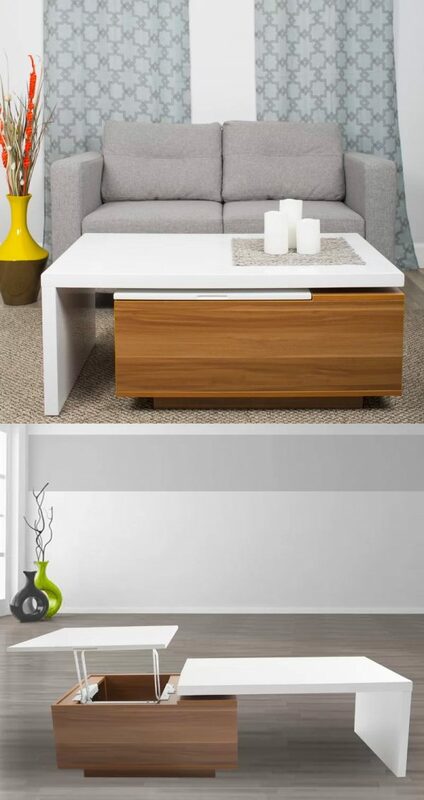 Modern White Coffee Table: Perched upon a sleek platform base, this white and black coffee table takes modern elegance to a new level with it’s tempered glass top and simplistically sleek design. The perfect table to hold your glass of vino while you peruse your latest reads. 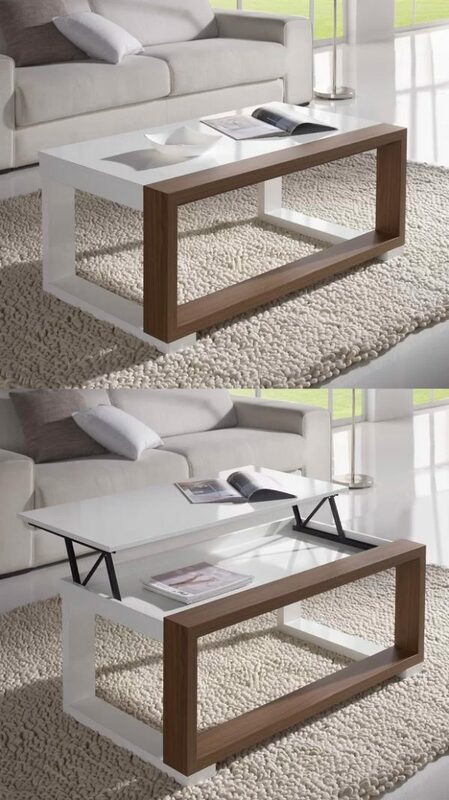 Modern White Rectangular Coffee Table With Chrome Legs: This chrome legged beauty not only boasts high style with its white gloss top and modern charm, it is also highly affordable, durable, and easy to clean. Available in Glossy White (shown), Cappuccino, Dark Taupe, Gray & Natural. Square Solid Wood Modern Rotating Coffee Table: This old timer with a modern twist is sure to be a conversation piece in any room. Elegant while stacked and charmingly unique while open, this solid wood coffee is a steal. Modern Oval White Swivel Coffee Table: High gloss with a retro 60’s feel, this swivel coffee table is a vintage charmer. The expandable table space is a gem when it comes to parties. Plus, the unique design is sure to catch everyone’s eye. 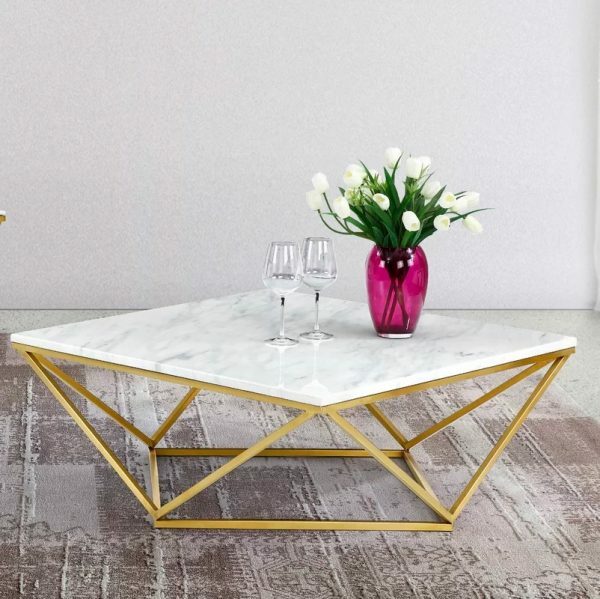 Modern Style Square Marble Coffee Table: This modern coffee table is both chic and sophisticated with its trendy geometric shape. 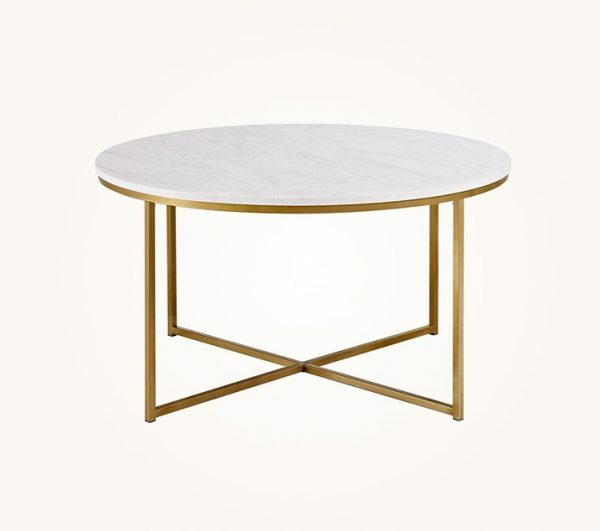 The genuine marble table top is available with gold legs (shown) or silver. Modern Round Coffee Table With Faux Marble Top: This faux marble coffee table is a great choice for those who want high style without the high price tag. Also available with a glass or walnut table top. The Drum Coffee Table: Minimalist with its round design and elegantly rich with a bronze finish over stainless steel, this is one luxurious coffee table. A great piece for when you need something simple, yet bold. 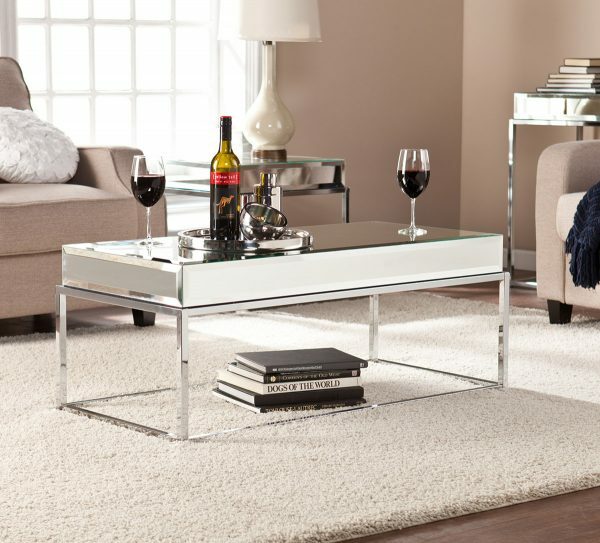 Modern Mirrored Coffee Table: Nothing says glam quite like the high shine of a mirror finish and that is exactly what you get with this contemporary coffee table. With its mirrored top and chrome plated legs, it gleams with modern charm. Stylish Modern Wood & Glass Coffee Table With Storage Drawers: Glass and wood combine to create this edgy coffee table that looks straight out of the future. Not only is it gorgeous with its bold angular design, it also features 4 stylish storage compartments and is available in white (shown) or espresso. Modern Glass Coffee Table: Floating fruit anyone? Bold, yet barely there, this airy, all glass coffee table is quite the show piece. The U shaped design and minimalist style make it a table that truly ties in with any decor. Modern Grey Coffee Table With Tempered Glass Base: The combination of the opaque top paired with the transparent glass sides elevate this simple and clean design to new heights. Available in 6 colors: Gray (shown), Cappuccino, Dark Taupe, Glossy Gray, Glossy White and Gray Cement. Black Modern Coffee Table: Simplistic and bold collide to create this lush, glossy coffee table. 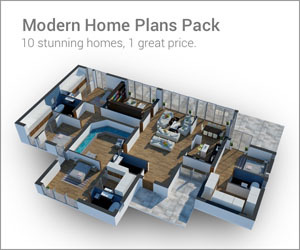 Its clean design, durability, and unusual shape make it a must-have for a modern bachelor pad. 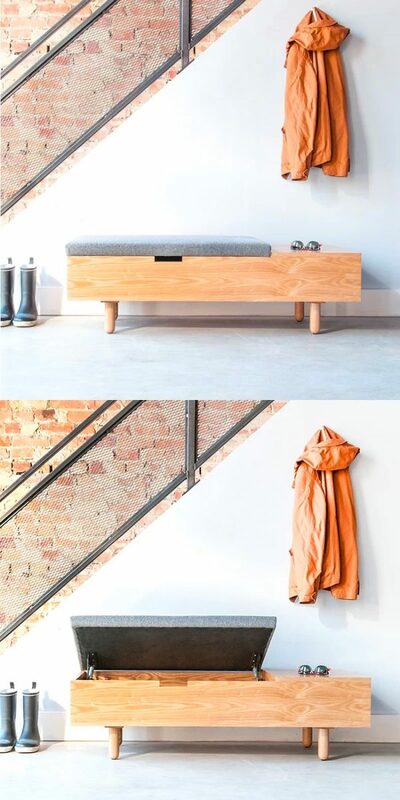 Small Modern Coffee Table: Who knew that wooden crates could look so great!? This rustic coffee table is a storage haven for any farmhouse styled decor. The ideal place to show off your latest reads, all while keeping your table top clear. Available in Weathered Wood (shown) or Espresso. 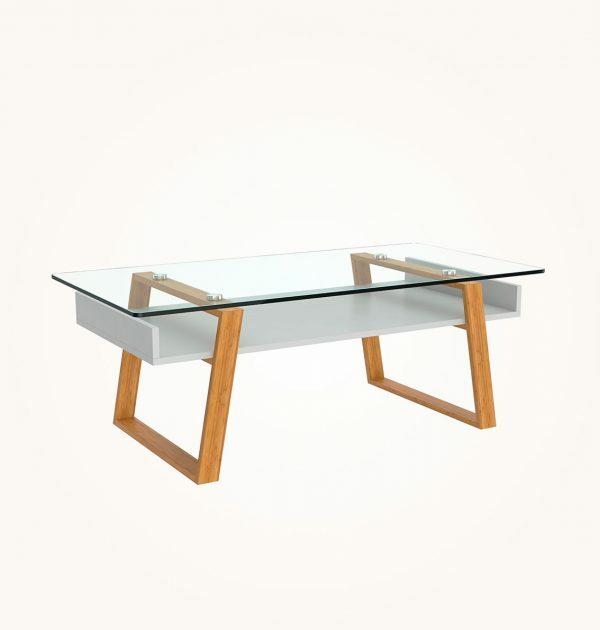 Modern Glass Top Coffee Table With Wooden Legs: Its unexpected wooden legs contrasting against the white shelf and glass table top make this timeless design a must have for either urban or country decor. Available in two models: Donatella (shown) and Massimo. Modern Rustic Coffee Table: The wood plank table top and contrasting finishes on this rustic coffee table help give it that most sought after country chic vibe. A matching sofa table and end tables are also available. Danish Modern Coffee Table: Part art, part furniture, this geometric coffee table is a modern treat with a Scandinavian vibe. The oval, Danish design is great for rooms with lots of style, but little space. 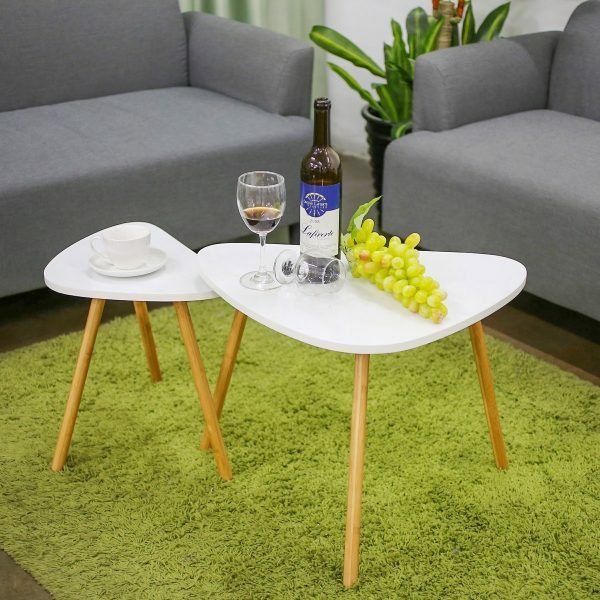 Scandinavian Style Coffee Table: Both stylish and functional, this mid-century coffee table also acts as a small storage solution and looks great while doing it. 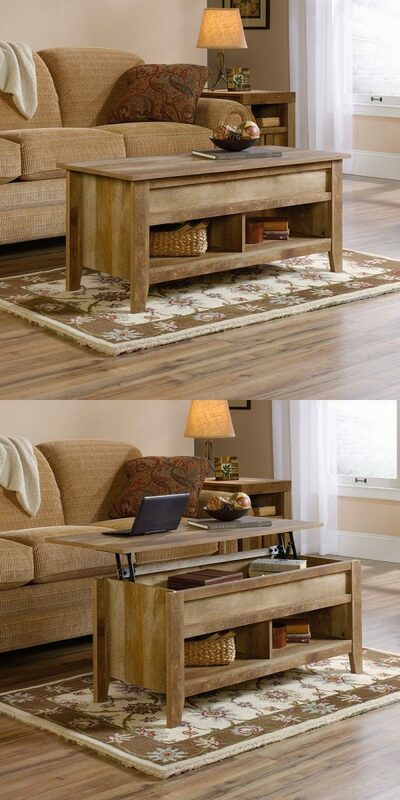 The matching end table, television stand, and desk are also available. 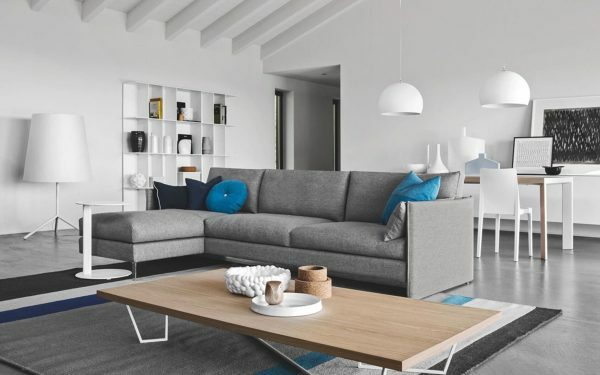 Around Coffee Table by Muuto: Sometimes simple is better and the Around Coffee Table by Muuto is the perfect example. This asymmetrical, Scandinavian design is authentically charming with a slice taken out of it’s outer ring. It is available in Natural Ash (shown), Gray, Dark Gray, and Anthracite. 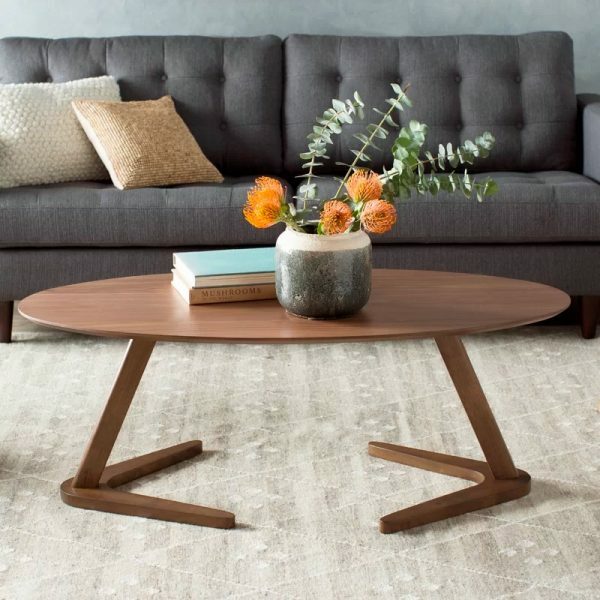 Noguchi Style Table: This mid-century modern coffee table’s build is based on this original iconic design, but will only cost you a fraction of the price. Available in Dark Walnut (shown), Black, and White. Low Modern Long Coffee Table: The light and airy color combination of this low coffee table helps breathe life in to any design situation. Prefer a bolder color palette? This table it is also available in multiple other top and base colors. Scando Low Modern Coffee Table: A organically chic coffee table or a minimalist piece of modern art? This walnut, sculptural piece not only provides ample table space, but it also has a unique place to stash your magazines. Mid Century Modern Coffee Table: Mid-century modern has never looked so good. 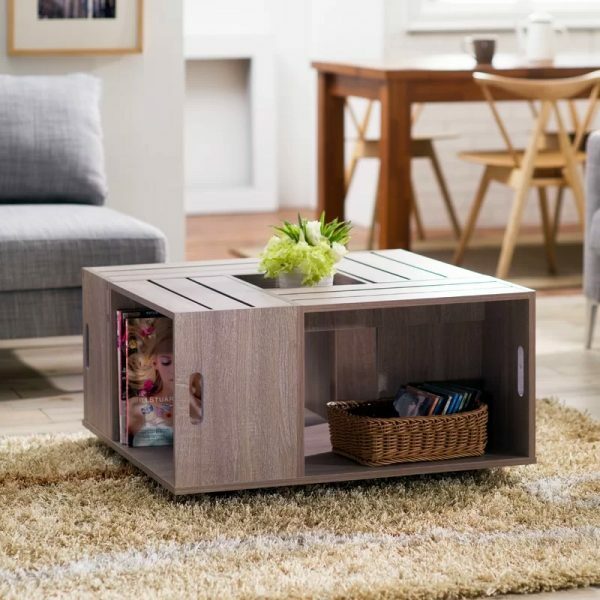 With a sleek wood build and 2 storage compartments, this is a stylish solution for your coffee table needs. Love the style? Be sure to checkout this curated list with tons more mid century modern coffee tables. 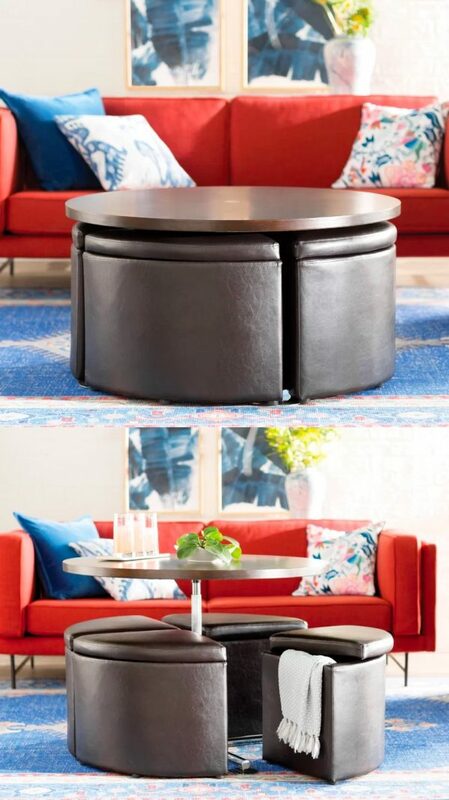 Small Mid Century Modern Round Coffee Table: Small, yet bold with an effortless elegance, this round coffee table is a mid-century styled living room’s destiny. The white top and two-tone wooden legs create the perfect contrast. 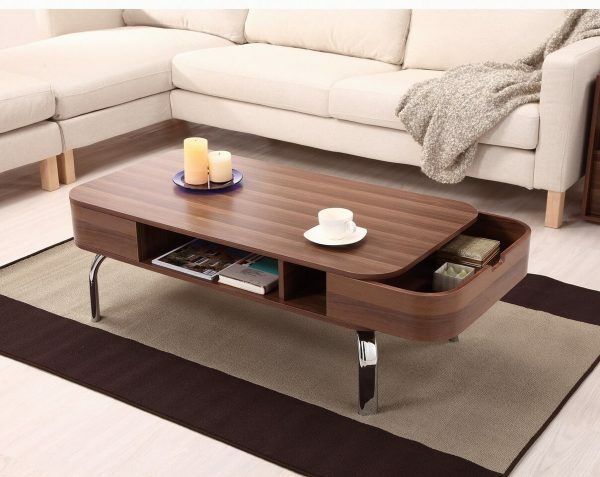 Walnut Finish Modern Rounded Rectangular Coffee Table: Lots of table space and storage? Check. Super stylish? Double check! With this rounded edge, walnut coffee table, you will never have to sacrifice style for function. Narrow Rectangular Lift Top Coffee Table With Chrome Legs: This lift coffee table is an innovative solution to create an at home workspace right in your living room. Because let’s be honest, who doesn’t want to be able to work from the comfort of their couch? 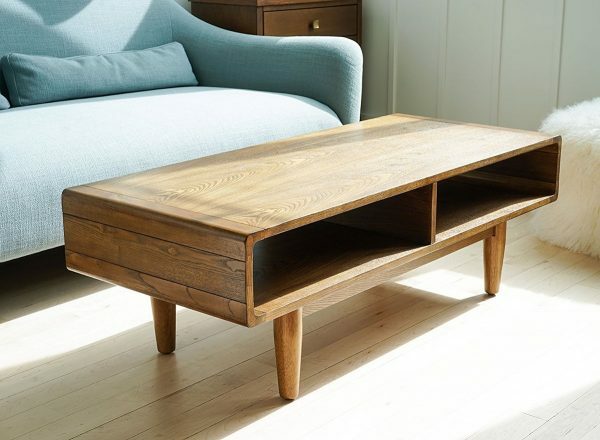 Modern Farmhouse Lift Top Coffee Table: A lift top coffee table with a rustic vibe? Finally! This multi tasking table is great for both storage and an extra work area, all while remaining affordable and farmhouse chic. 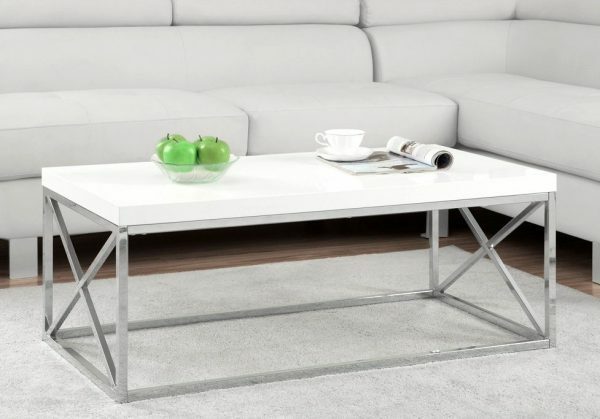 Modern White Lacquer Lift Top Coffee Table: Small spaces rejoice! 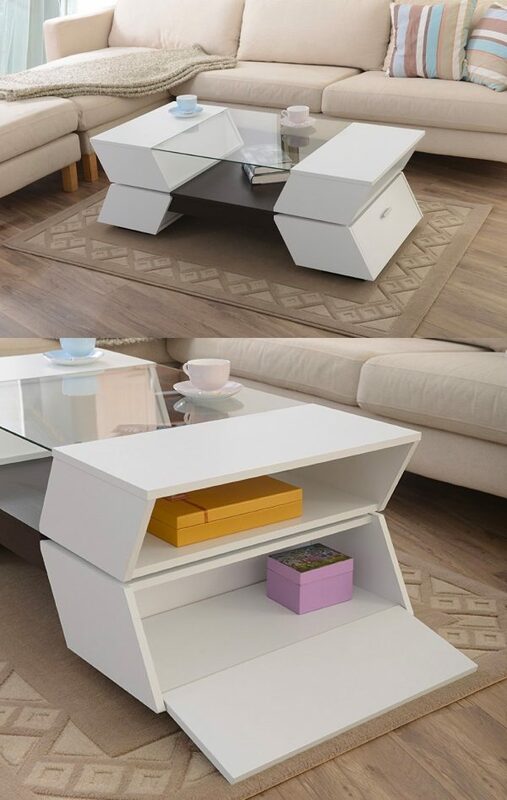 An easy-clean coffee table with both storage and a lift top. Coffee tables definitely aren’t just for lounging anymore. 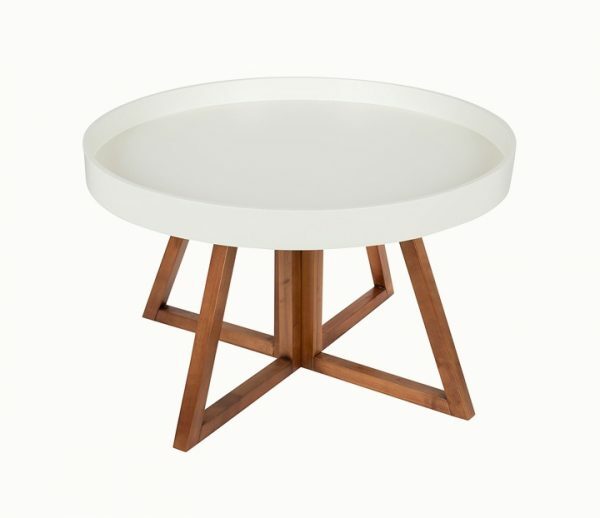 Stylish White & Walnut Lift Top Coffee Table: Stylish meets functional with possibly the most useful coffee table ever. With a two-toned finish, storage, and a table top that pops up to meet you, what more could you ask for? Modern Minimalist Coffee Table With Lift Top Unit: The 360 degree swivel sets this lift top coffee table above the rest. The perfect piece for either a small or large space. with its multiple configurations. 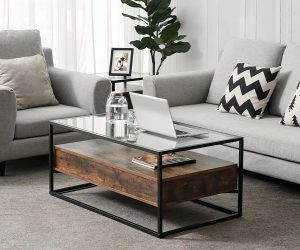 Modern Scandinavian-Style Lift Top Coffee Table With Storage: Not many coffee tables are sleek, stylish, practical, and unique, but this one effortlessly fits the bill. 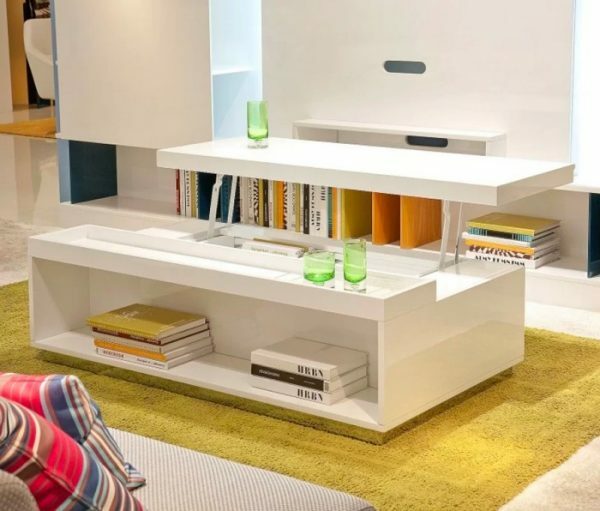 This Scandinavian style, lift top coffee table comes up to meet you and it also features compartmental storage. A great solution to hide away clutter for smaller spaces. We loved the idea so much, we created an article exclusively for lift top coffee tables, so be sure to check it out! 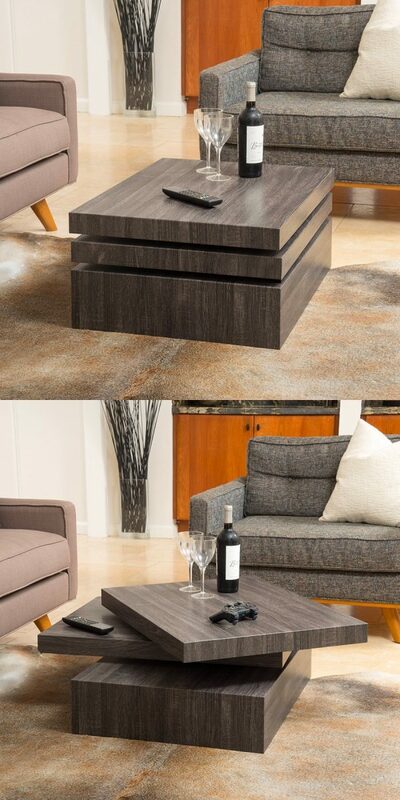 Gas Lift Transforming Coffee Table: Never run out of seating again with this transforming coffee table. Sure, other coffee tables have seating wedges that store underneath it, but this one also lifts to create a functional table for those seats. As if that isn’t enough, the seats are ottomans for extra storage. 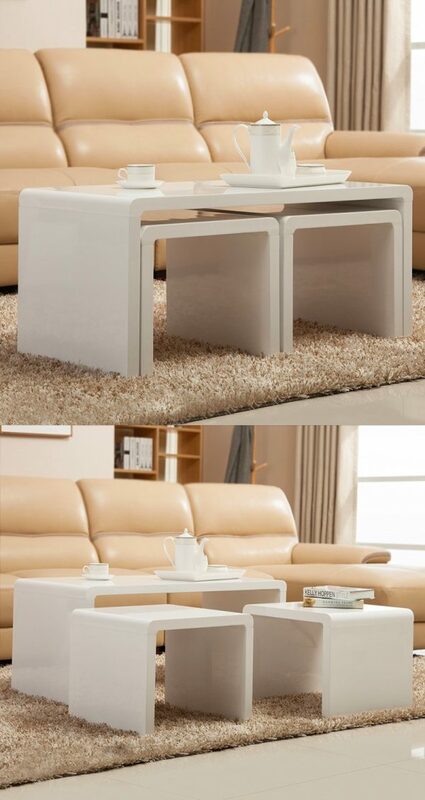 Modern White Nesting Coffee Tables:Nesting coffee tables are a great solution for those with minimal space. These modern white ones are particularly chic with their high gloss white finish and U shape design. Modern Scandinavian Style Nesting Coffee Tables: Ever just wish you had a smidge more of table room? These affordable, Scandinavian nesting tables are great for that. Available with a round table top (shown) or triangular. 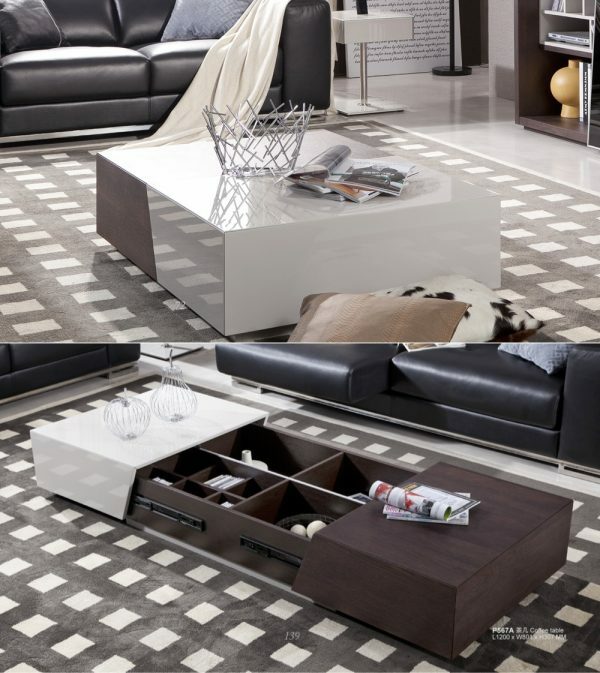 Modern 3 Piece Nesting Coffee Table: Modern nesting tables with a leggy twist. Not only do these make a great coffee table, but they can double as TV tables or couch trays. The unique L shaped legs tuck under the sofa, so no more hunching! Coffee To Dinner Table Transformer: The bold chrome legs are surprisingly not the most unique feature on this contemporary gem. A real space saver, this coffee table pops up to become a dining table! How cool is that? Available in White Laminate (shown) or Oak Wood Veneer. 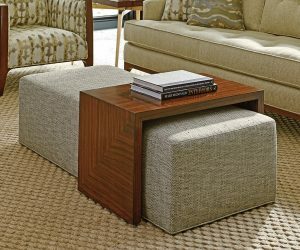 Rectangular Ottoman Coffee Table With Slide: Slide to the left, now to the right. 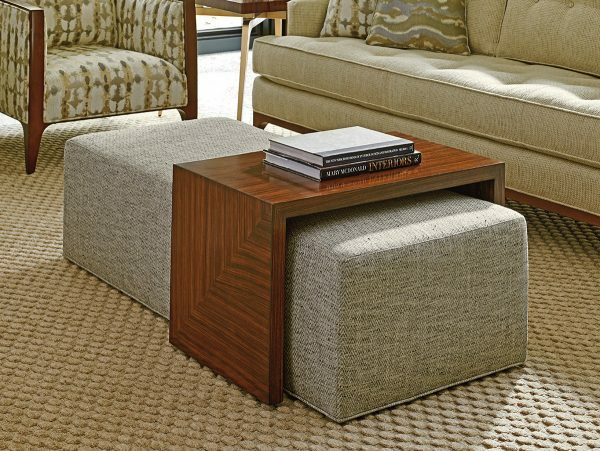 This rectangular ottoman doubles as a coffee table with its U shaped table overlay. Designed for those looking for a unique table with a contemporary touch. Modern Sofa-Style Coffee Table Ottoman: The cube pattern on this white leather ottoman brings both texture and sophistication in to a lounge or living room. Available in White (shown) or Black. Be sure to visit out collection of ottoman coffee tables for more great designs! 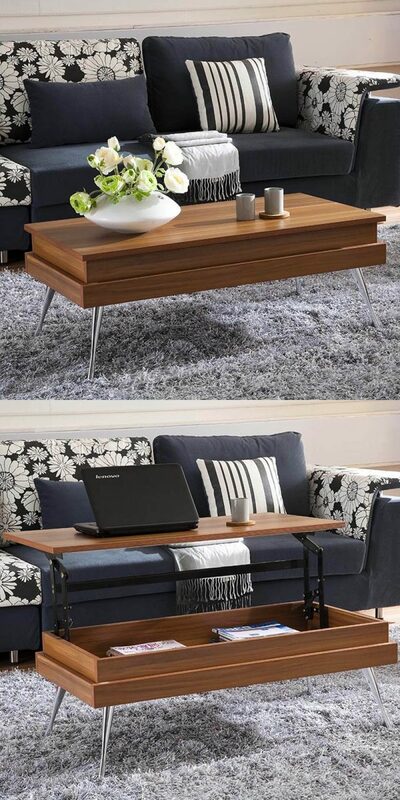 Expandable Transformer Coffee Table: Coffee table, TV table, and dining room table rolled in to one. Easy to move with wheeled legs and an X lift mechanism, this is the table for a home where very inch of space counts. 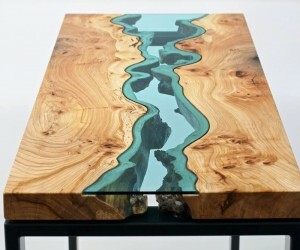 Live Edge River Table: If you want a truely unique coffee table, then handcrafted is a must. Created by hand with a mix of live edge wood, metal, and resin, no two are exactly alike, so you are guaranteed a one-of-a-kind table. Aquarium Coffee Table: Nemo may have found a new home! 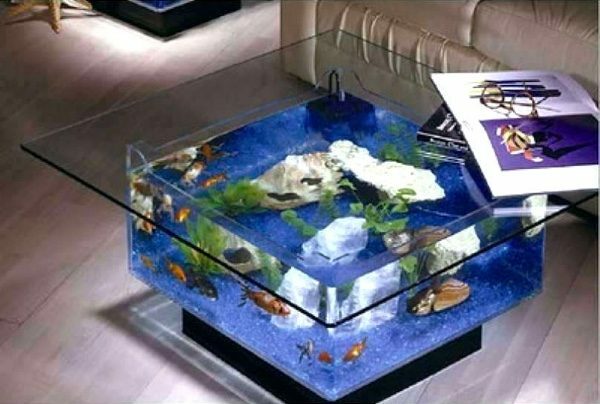 Forget plain old fish tanks, try a modern aquarium coffee table. A guarantee conversation piece. 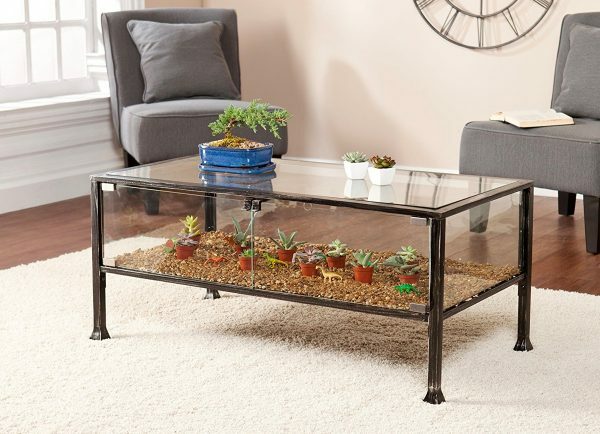 Terrarium Coffee Table: If fish aren’t your thing, what about plants? This glass terrarium is an excellent space to house succulents and plants. Plus, if you have any pets, they won’t be able to take a nibble. 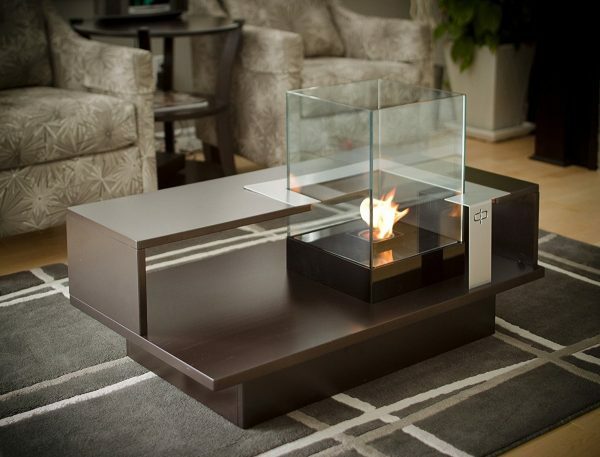 Modern Coffee Table With Built In Fireplace: This coffee table takes cozy to a whole new level with its built in fireplace. A zen-like place to relax with a glass of wine and a good book. Available in Espresso (shown), Latte, Silver Gray, Textured Black, and White. 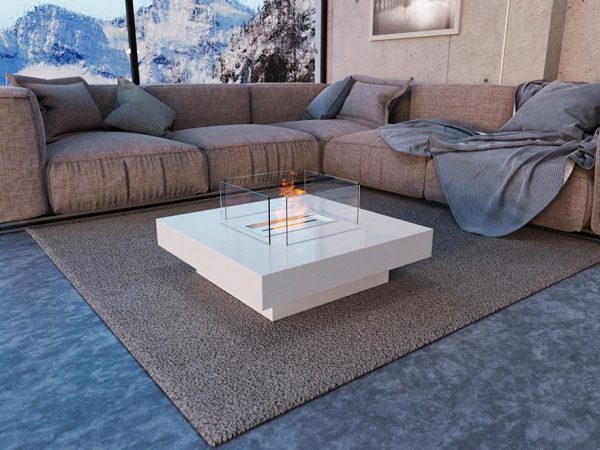 Modern White Coffee Table With Smokeless Fireplace: For those with no room for a fireplace, this firey coffee table may be the solution. Not only is it soothing and cozy, but is it also smokeless. Mermaid Coffee Table: A funky table for those with a taste for the modern and unusual. 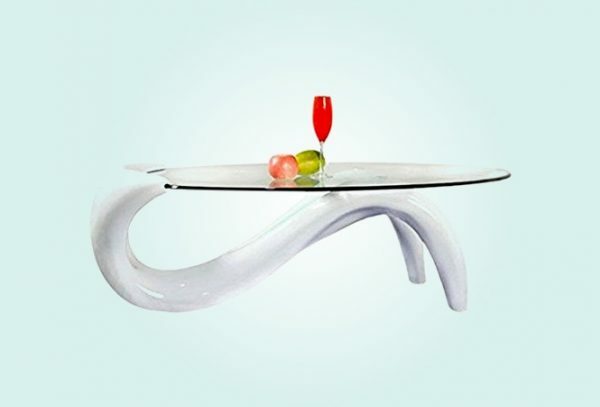 The mermaid coffee table is a sculptural marvel with its free flowing frame attached to the oval glass top. Available in White (shown) and Black. Smart Coffee Table With Fridge, Speakers & Charging Ports: We expect so much from our cars, computers, and phones, so why not our coffee table? 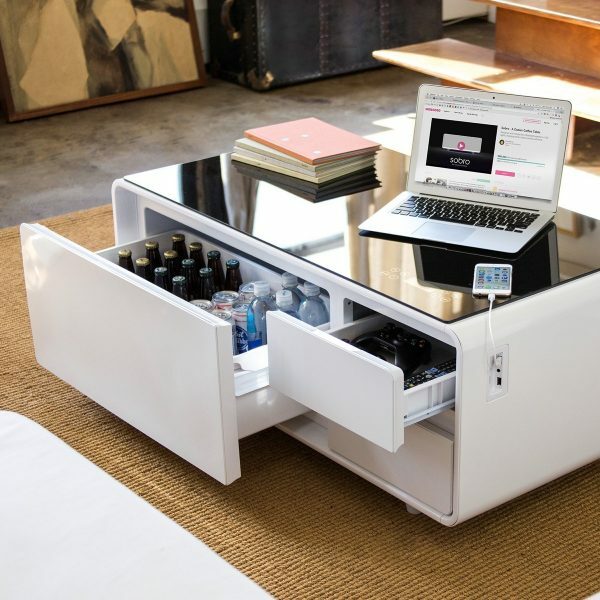 Not only will this smart coffee table add a modern spark to any room, it is also uniquely equipped with a fridge, speakers, and charging ports. 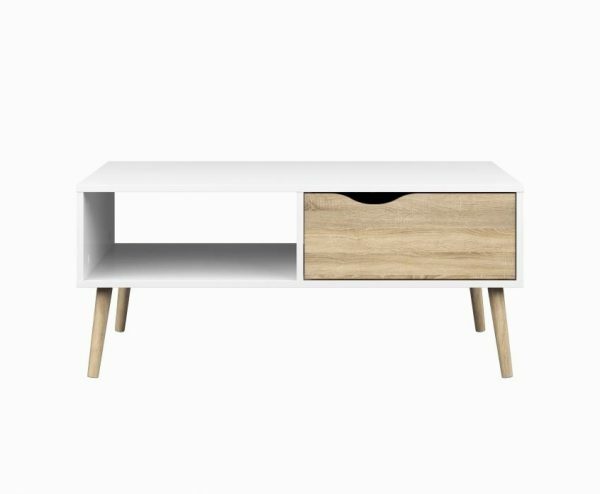 Available in White (shown), Black, and Wood. 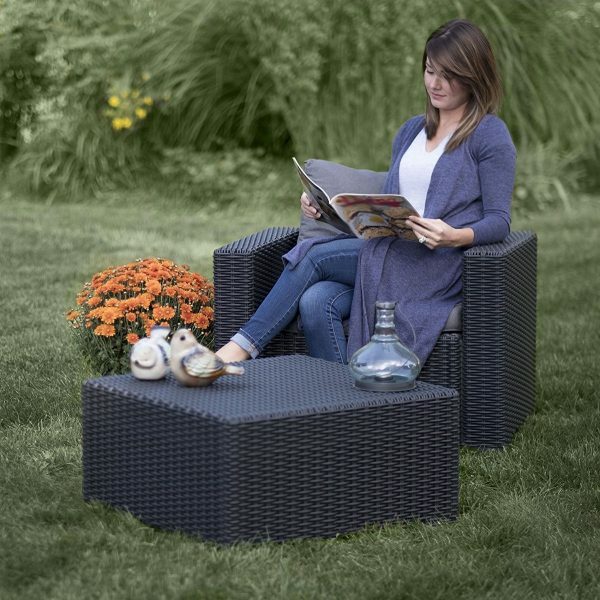 Modern Outdoor Coffee Table: Relax in style with this simple and affordable outdoor coffee table. Throw your feet up while you read a good book or rest your drink while you soak up the sun. Available in Graphite (shown) or Cappuccino. 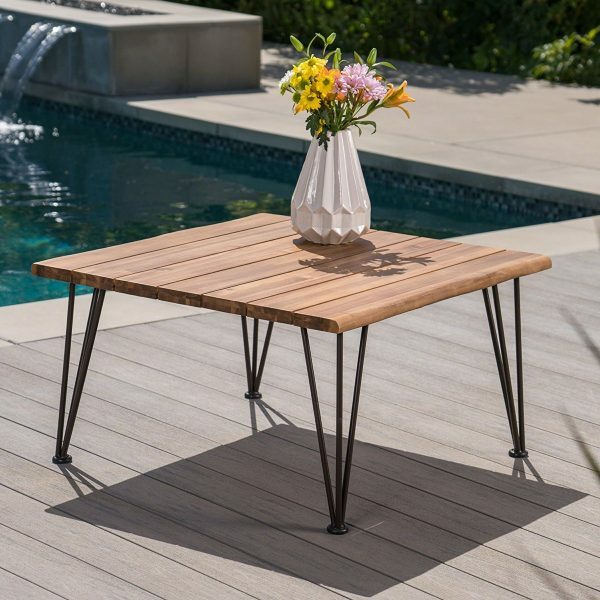 Modern Wooden Outdoor Coffee Table: This wood slat coffee table is meant for outdoor use, but it’s so chic that we would understand if you wanted to use it inside too. The metal and wood combo on this rustic table make it an asset to any industrial styled patio or home.